Have the Marines turned a corner in Sangin? 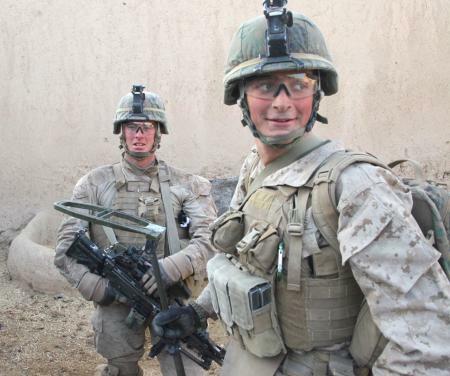 You are at:Home»Afghanistan»Have the Marines turned a corner in Sangin? Friends and family of Marines in the Taliban stronghold of Sangin, Afghanistan, got a bit of good news today when the top Marine commander in Afghanistan said influential tribal leaders there have agreed to stop insurgent attacks and push out foreign fighters. Maj. Gen. Richard Mills said Marine leaders were “cautiously optimistic” of the agreement, according to this AP report. The deal was reportedly reached with the Alikozai tribe, which controls most of the villages in a 17-square-kilometer region of the Upper Sangin Valley, Afghan officials told the AP. After an awful few months of combat, any promising news out of Sangin is a good thing. Third Battalion, 5th Marines, out of Camp Pendleton, Calif., has lost 23 men there since taking over the area of operations Oct. 8, and dozens more have been badly wounded. Still, the announcement raises as many questions as it answers. Is it the beginning of an “Anbar Awakening” in Sangin? Or will this remain an agreement in name only, with fighters taking additional months to lay down their arms? For now, let’s greet it with cautious optimism and hope for the best. In the meantime, 3/5 could still use our thoughts and prayers. GOD Bless 3/5 from a 3/6 dad. My prayers are going out day and night to 3/5. Stay safe guys, and to my husband SSGT. Ramirez, stay safe and I love you! Keep it up 3/5!! My son Mat is currently also with the 3/5 India Company. Nice to see a smile on one of our guys, God Bless the 3/5. Come home safe!!! Our hearts are with 3/5 as they walk that valley. My thoughts and prayers are with these guys every single day. Not a day goes by I don’t have them on my mind. Until they all come home, Semper Fi 3/5! first time i have seen nathan face since september. stay strong i love you.